Create Fun and Play Every Day. Build Open, Honest and Respectful Relationships with Everyone We Meet. Only Offer Excellence Through Service and Communication. 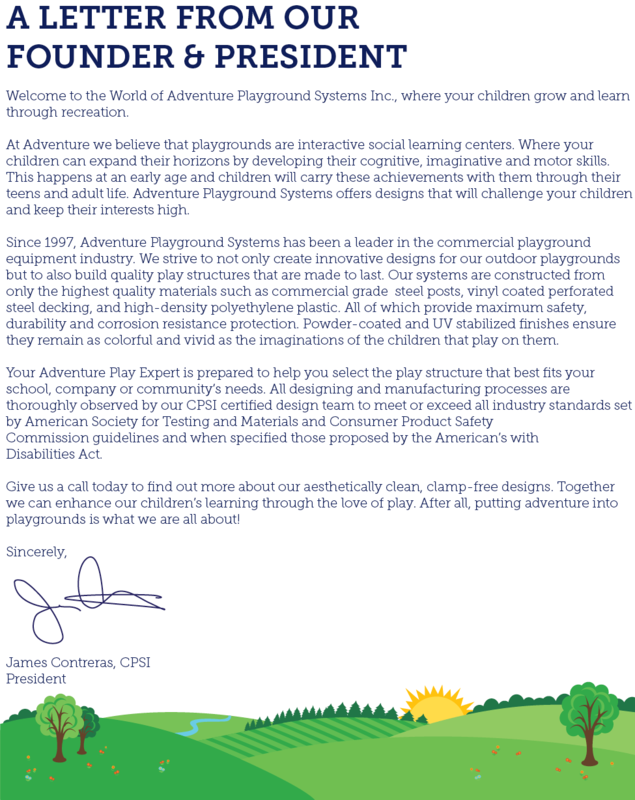 At Adventure Playground Systems, we pride ourselves in providing a safe environment for all children to grow and nurture their natural sense of adventure. We achieve this by offering innovative products at attractive prices, backed by excellent warranty and customer service. That is why we are committed to providing our customers with the highest quality products from our manufacturing facility in Houston, Texas. Additionally, we offer a wide range of playground and park products from our partnering manufacturers to meet your every need. We know and trust that each of our selected partners offer only the highest quality products and are also leaders in our industry. Our body of work and reputation is a source of pride for our organization. It speaks volumes for the amount of passion and professionalism that is put forth daily by our team of Adventure Play Experts. Our reputation has been built off over twenty years of outdoor recreation projects that we have created. Thousands of client relationships we have cultivated, and the hundreds of communities that we have enhanced through the world of play. We build memories, family and friendships.